What do these stats tell us? More and more businesses today rely on content for their marketing efforts. Content marketing and Inbound marketing are not mere buzzwords, but are a necessity, especially for B2B marketers. Whether you are an agency servicing customers or a business with an in house marketing team, you need to seriously consider content and inbound marketing, if you haven’t already. 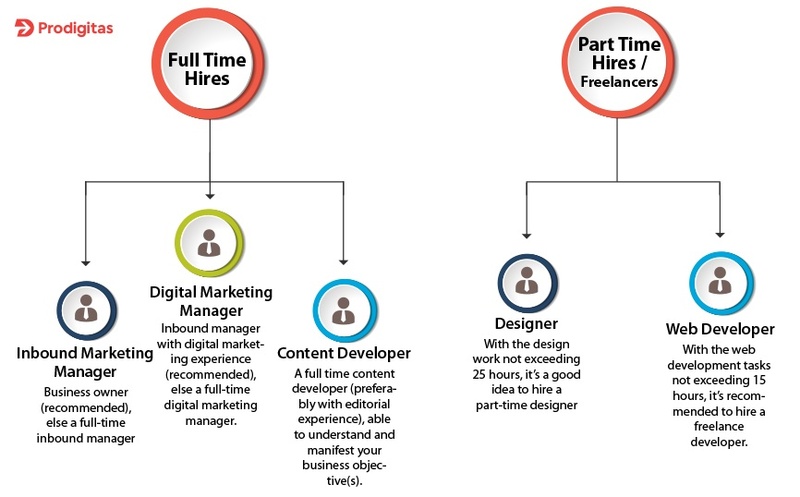 Inbound Marketing manager Ownership of the entire inbound marketing campaign Drives the entire inbound marketing campaign by coordinating with designer, web developer and digital marketer. Ensures that all communication and activities adhere to business objectives. Content Developer Ownership of content strategy and development Plans the content calendar and strategy based on inputs from inbound marketing manager. Creating fresh content and repurposing existing content to be in sync with the organization’s marketing activities. Designer Overall design of the website, landing pages,blogs & social media creatives Creating attractive infographics, ebook covers, landing pages & website design. Ensure a great UI/UX for all deliverables and to produce appealing social media creatives. Web Developer Ownership of creating & maintaining website as well as landing pages Creating the website and the landing pages based on the designs. Maintenance of website & landing pages once created. Ensure pages are responsive for all devices. Digital Marketer Responsible for integrating digital marketing activities(SEO, PPC, SMM) into inbound marketing campaigns. Sharing all the content created through inbound strategy to different digital channels. Analysing & reporting the trends to understand the effectiveness of the campaign. How Much Time Should I Invest Every Month On An Inbound Marketing Campaign? More the better. The more content you produce, and faster you are able to get it out, better will be your results. From our experience, every business needs an investment of minimum 100 to 150 hours per month to achieve success in Inbound Marketing. This time is distributed among all activities listed earlier. We would allot at least 60% of the time to producing content and the rest in promoting it. 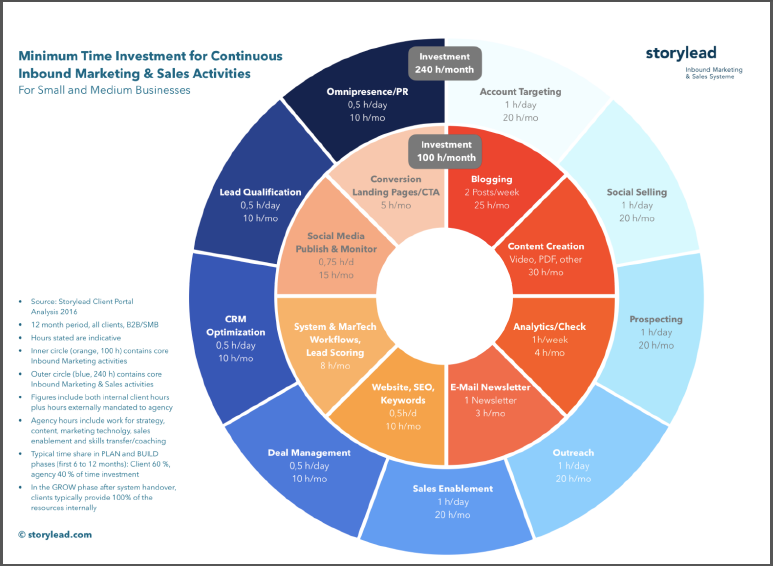 Here is how Storylead suggests breakup of activities with timelines dedicated to them. Should I Hire In-House Or Manage Freelancers? Depending on whether you are an agency or a business, you will need to make a decision on either hiring full time staff to fulfill these roles or work with freelancers. If you are an agency with multiple clients, hiring full time staff may make more sense. We typically hire in house if we can provide for at least 30 hours of work per week. If you have a flexible hiring strategy, you could also look at hiring part time staff that could work from your workplace for a few hours every day. This has worked well for us in the past. However you want to structure your team, you need to make Inbound marketing a regular part of your marketing efforts. And all the team members will have to take ownership of their tasks & work together to achieve the shared goal of effective inbound marketing. If you need help in setting up your inbound marketing campaign, get in touch with us! 7 Habits of Successful Inbound Marketers to Adopt Right Now! 5 Tips for an Effective PPC Proposal That Wins Clients!